Welcome to the Website of Fina (Fee na) Gardens where we can share our enthusiasm for the beauty of peonies with the rest of the world through little more than a click of a computer mouse. The "we" I refer to is myself, Sam Finazzo and wife, Helen. Partners in marriage for more than 38 years now, we decided 1998 to become partners in a new venture that would enable us to use our interests, talents and professional skills to build something of our own. 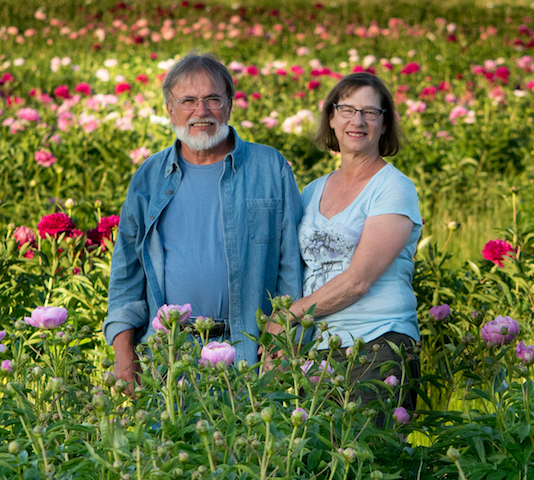 So in 2002 we bought a 60-acre farm with fertile silt-loam soil in Northwest Wisconsin, where cold winters and temperate summers provide a place in which peonies thrive. We kept our day jobs and began using our evenings, weekends and vacation time to gradually, but steadily, build the business. The 200 peony plants-comprising about 20 varieties-we had started growing at the back of our 1-acre lot in the city has become over 15,000 now on the farm. That number includes the acquisition of dozens of new cultivars added to our collection over the past 12 years. Ultimately we hope to have a few hundred varieties that our gardener customers will be able to choose from, as well as provide 150,000 blooms for sale each year to wholesale cutflower distributors. The name of our business, Fina Gardens, has its roots in my Sicilian heritage and says something about our vision for this venture. Fina, which means "fine" in Italian refers to the quality that we strive for in both our cutflowers and root divisions. That quality is evident in the long stems and big blooms of our bouquets and the extra large roots we offer to those who want to grow their own. So along with quality we think you'll agree we also provide good value.